The most common surgical approach to treating prostate cancer is to remove the entire prostate using a procedure called a Radical Prostatectomy. While a radical prostatectomy may be performed as an open procedure, the most common type of prostatectomy is robotic radical prostatectomy, which requires very small incisions to be made in the abdomen by the surgeon. UCLA urologists offer robotic prostatectomy as a treatment approach for patients with early stage prostate cancer. UCLA has one of the longest and largest robotic prostatectomy programs in the nation. It offers a minimally invasive treatment with less blood loss and a more rapid overall recovery. A robotically assisted procedure puts the advantages of minimally invasive surgery in the hands of skilled UCLA cancer surgeons who have a wealth of experience in treating prostate cancer through open surgery. These tools allow them to apply their skills in successfully treating prostate cancer in a minimally invasive procedure while sparing nerves to preserve a man’s sexual function and sparing continence to preserve urinary control. The robotically assisted procedure is performed using five or six keyhole incisions, and offers the advantages of reduced blood loss, reduced pain, shorter hospital stays and a significantly faster recovery. Robotic tools offer freedom of motion that is similar to that of the human hand; an improvement over the traditional laparoscopic tools. They can also scale their motions to achieve much more precise and fine movements without tremor. Visualization is improved with a more mobile camera system that provides a three-dimensional view. Advanced MRI imaging is used to plan and guide the surgical procedure, an innovation developed by UCLA Urology. 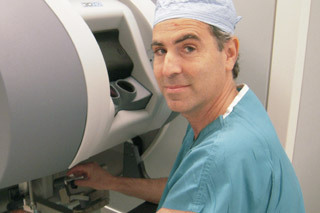 Prostate Surgery Doctor: Robert Reiter, M.D. Director, UCLA Prostate Cancer Treatment and Research Center. UCLA Urology robotic surgeons have been offering outpatient prostatectomy since 2011 for appropriate patients. Men are discharged to home the same day of surgery instead of remaining in the hospital overnight, as is customary. Same-day surgery for prostate cancer is made possible by the extremely low risk of bleeding and need for blood transfusions (<1%), as well as the low degree of pain associated with robotic surgery. Men usually return to their physician’s office the morning after surgery for a routine check and within one week to remove either a urethral or suprapubic tube that drains the bladder following surgery (so called urethral catheterless surgery). UCLA Urology surgeons also no longer use abdominal drains in appropriate patients following this surgery, reducing discomfort and bother associated with the surgery. Outpatient, or same-day, prostatectomy is particularly suited for young men without any prior health conditions. A nerve-sparing radical prostatectomy is ultimately designed to preserve a man's sexual function. The success rate in preserving sexual potency is dependent on a few factors - a man's age, the quality of his erection prior to the surgery, and the surgeon's skill and experience in protecting and preserving the nerves during the Prostate nerve-sparing operation. Other surgical procedures may be performed on men with advanced or recurrent prostate cancer disease. For these men, in addition to removing the prostate gland, the lymph nodes in the area of the prostate may be removed either before or during the same operation. UCLA offers both standard lymph node removals as well as what is termed “extended lymph node dissection” for men with a high-risk of nodal involvement. This is done to determine if the prostate cancer has spread to the lymph nodes. The Men’s Clinic at UCLA offers a penile rehabilitation program for men after prostate cancer therapy. The idea of penile rehabilitation is to optimize blood flow to the erectile tissue as it is recovering from surgery or radiation therapy. For more information about prostate cancer treatment in Los Angeles and to make an appointment with a UCLA prostate cancer specialist, call (310) 794-7700.